Play is important for kids. It's so important, in fact, that I've spent my career advocating for play. And I'm not the only person who thinks play is necessary and beneficial. Hundreds of experts love play, too. Read more about some scholarly studies that prove the benefits of play and learn why play is so important for the children we know and love. Kids thrive when their caregivers play with them. I know my girls tell me that they feel more secure and loved when we play together, and scientists agree. They performed a study that explores how play gives parents and kids an ideal venue for engagement, and the study's results also discuss the importance of solo play and self-guided play. I encourage caregivers to use this research to discover tips for how to interact and play more with your kids. In my opinion, kids need recess. Without it, they have trouble focusing and concentrating, and behavioral problems increase. 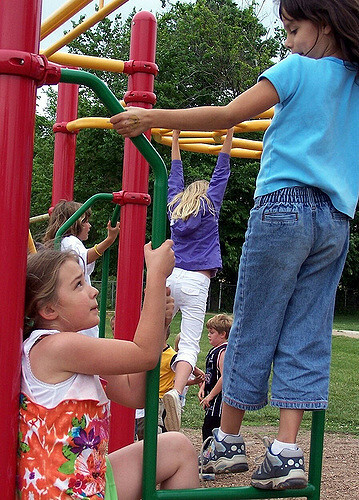 One study revealed several benefits of recess. It explored numerous articles and concluded that recess gives kids a necessary break from the academic rigors they face. Unstructured recess is especially beneficial since it boosts children's creative, emotional, and social development. My girls and all of the students, teachers, and caregivers we know appreciate that this research supports recess in schools. Nature has a powerful effect on kids. When my girls get bored, feel upset, or start arguing, we head outside, where they almost immediately feel calmer and more relaxed. Kids need nature, and one study examined the role nature plays in a child's well-being. Researchers found that kids whose homes included greenness showed increased levels of cognitive functioning. If you want your kids to be smarter, send them outside into nature where they can play, explore, and learn. As many as one in 10 kids have attention deficit hyperactivity disorder (ADHD). These children have trouble concentrating and focusing in and out of school, which inhibits their ability to learn and achieve. Play can ease their symptoms and help them succeed in life. In one study, kids who played after school and on weekends experienced fewer ADHD symptoms. If a child you care for has ADHD, provide plenty of play time. If your kids are like mine, they enjoy transforming craft supplies, cardboard, and other trinkets into toys. It turns out that there's a scientific reason for this behavior. Inexpensive items, including crates and buckets, are effective at encouraging children to be active and creative. Kids who play with simple, everyday objects become more active, experience creativity boosts, and enjoy improved problem-solving abilities. There's nothing wrong with expensive toys, but your kids will learn and develop as they play with cheap everyday items, too. Experts love play, and these five scholarly studies outline the benefits of play and prove that play is important. As caregivers, we should agree and let our kids play and explore. What will you do to encourage play today?